This celebration of women leaders is coordinated by BSR's HERproject, a collaboration that empowers low-income women across global supply chains through workplace-based programs on health, financial inclusion, and gender equality. The Estée Lauder Companies, Inc., Nordstrom, UGG®, and Williams-Sonoma, Inc. are strategic HERproject partners and are implementing HERproject training programs with their own key suppliers. 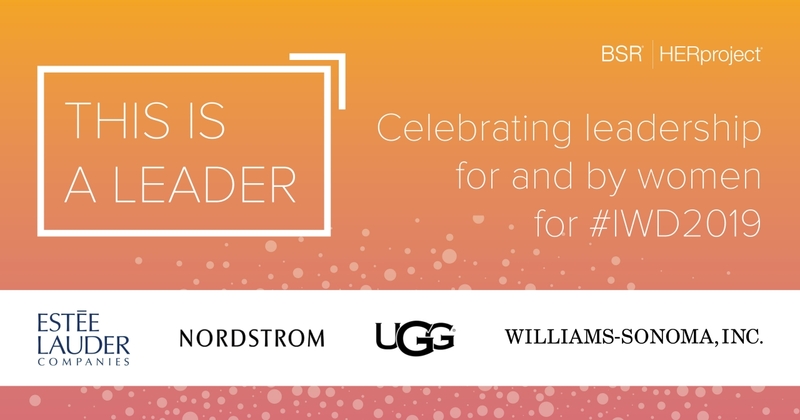 To celebrate International Women’s Day, leaders from The Estée Lauder Companies, Inc., UGG®, and Williams-Sonoma, Inc. will speak at the “This Is A Leader” campaign event and discuss their vision for women’s leadership on 7 March at NeueHouse in New York City. The event is open to media; to RSVP, please email Dominic Kotas at dkotas@bsr.org. The accompanying social media campaign begins today and will run through March using the hashtag #ThisIsALeader. BSR's HERproject™ is a collaborative initiative that strives to empower low-income women working in global supply chains. Bringing together global brands, their suppliers, and local NGOs, HERproject™ drives impact for women and business via workplace-based interventions on health, financial inclusion, and gender equality. Since its inception in 2007, HERproject™ has worked in more than 750 workplaces across 14 countries and has increased the well-being, confidence, and economic potential of more than 850,000 women. The Estée Lauder Companies Inc. is one of the world’s leading manufacturers and marketers of quality skin care, makeup, fragrance and hair care products. The Company’s products are sold in over 150 countries and territories under brand names including: Estée Lauder, Aramis, Clinique, Prescriptives, Lab Series, Origins, Tommy Hilfiger, M·A·C, Kiton, La Mer, Bobbi Brown, Donna Karan New York, DKNY, Aveda, Jo Malone London, Bumble and bumble, Michael Kors, Darphin, Tom Ford, Smashbox, Ermenegildo Zegna, AERIN, Tory Burch, RODIN olio lusso, Le Labo, Editions de Parfums Frédéric Malle, GLAMGLOW, By Kilian, BECCA and Too Faced. Williams-Sonoma, Inc. is a specialty retailer of high-quality products for the home. These products, representing distinct merchandise strategies — Williams Sonoma, Pottery Barn, Pottery Barn Kids, West Elm, PBteen, Williams Sonoma Home, Rejuvenation, and Mark and Graham — are marketed through e-commerce websites, direct-mail catalogs and retail stores. These brands are also part of The Key Rewards, our free-to-join loyalty program that offers members exclusive benefits across the Williams-Sonoma family of brands. We operate in the U.S., Puerto Rico, Canada, Australia and the United Kingdom, offer international shipping to customers worldwide, and have unaffiliated franchisees that operate stores in the Middle East, the Philippines, Mexico and South Korea, as well as e-commerce websites in certain locations. In 2017, we acquired Outward, Inc., a 3-D imaging and augmented reality platform for the home furnishings and décor industry.